Projections of lines on lines. Projections of lines on Planes. Projections of Planes on Planes. To start with the simplest case consider a point projected onto a two dimensional line. P2 = scalar representing point in terms of its distance along line. • = vector dot product. line = line represented by a normalised length vector (cos(θ),sin(θ)). In other words we transpose the line vector and multiply it by the vector represented by the point in question. real() = a function which takes the real part and sets the imaginary part to zero . We can also do the inverse transform, that is, take an input which is a scalar distance along a line and to map this to a two dimensional position on the line. P2 = vector representing point on the line. What if we want to map the points onto a line but leave that line in two dimensional space (as is shown in the diagram above)? We can do this by mapping to a scalar value and then mapping back to two dimensions, that is, apply both of the above transforms in sequence. That is the component of P1 that is parallel to the line. 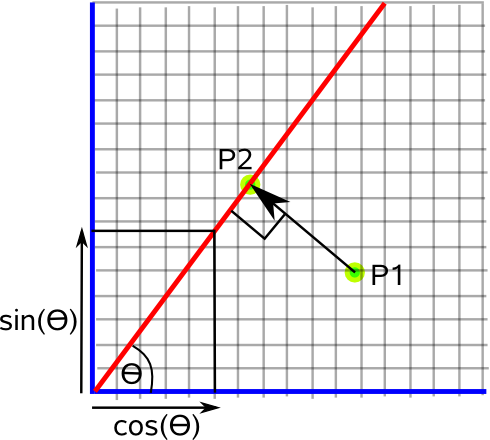 P2 = vector giving the position of the point after it is transformed onto the line. That is the perpendicular distance between P1 and the line. We can repeat the above results using geometric algebra notation. Mapping a point in 2 (or more) dimensions to a one dimensional (scalar) value to represent the distance along the line. A = vector representing a point. B = vector representing a line. a = scalar length along line. We can use scalar multiplication to get the two dimensional position from the scalar length along the line. We can also project onto a line in higher dimensions such as 3D, we just increase the dimension of the vectors that we are using. line = line represented by a normalised length vector. This will now be (x,y,z) where x2+y2+z2=1.